Social media is always evolving, and users’ behavior changes with it. One fact that doesn’t change is that all social platforms move fast, with a constant stream of content vying for attention. You want to get the most eyes possible on your content and maximize engagement by knowing the best times to post on social networks. It’s not enough to guess when users might log in to a given network, or when audiences in your niche are hungriest for the latest information. Now that more and more brands from all kinds of industries realize the value of connecting with their audiences on social networks, it’s important to understand how your audience uses social platforms and what they want out of your content. An ecommerce brand may see social engagement follow daily and seasonal patterns of shopping engagement, while a corporate thought leadership account may see plenty of clicks at the start of the workday when readers are looking for inspiration. 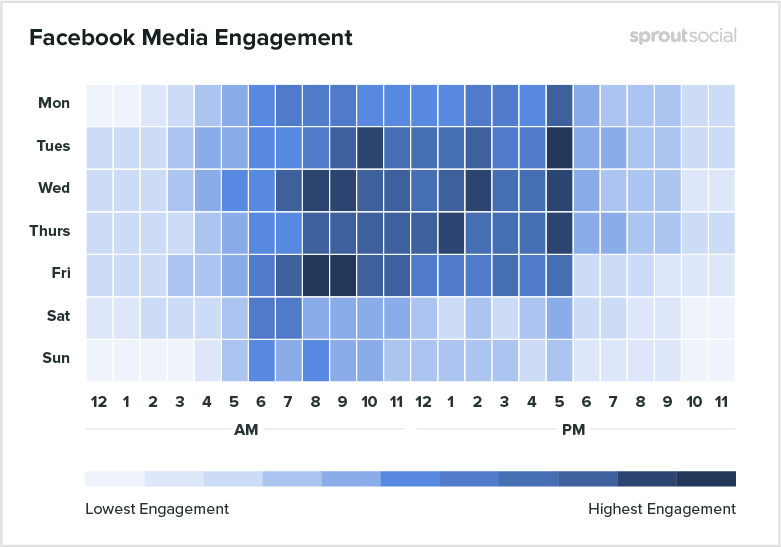 In order to get granular and find out the best times to publish on social media for four social media networks, we worked closely with Sprout’s data science team to pull this information based on our customers. The data below shows when our 25,000-plus Sprout customers were engaged the most (and least) across major networks and broken down by industry. Disclaimer: Data from Sprout Social include users from various plan types, industries and locations. All time frames are recorded in Central Time Zone (CST). 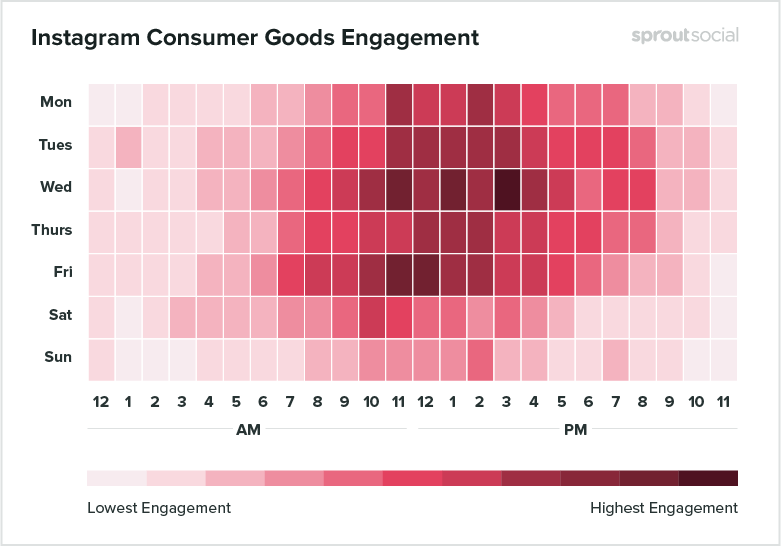 Number of engagements represents total engagements a brand received on the specific channel during that hour time frame. Industry-specific data includes mid- to high-level engagement times. Facebook has over two billion active users, making it the most populated platform by far. This huge audience means there’s a major opportunity for organic engagement on Facebook, if you keep in mind the current Facebook algorithm. The changes in the algorithm in the last couple of years have emphasized friends, family and meaningful connection, so content that drives genuine engagement is your best bet. In addition to a content strategy that connects meaningfully with your audience, you’ll best meet this need for engagement by posting at the times when users are most active on the network. The best times to post to Facebook are Wednesday at 11 a.m. and 1 p.m.
Wednesday is the best day to post on Facebook. 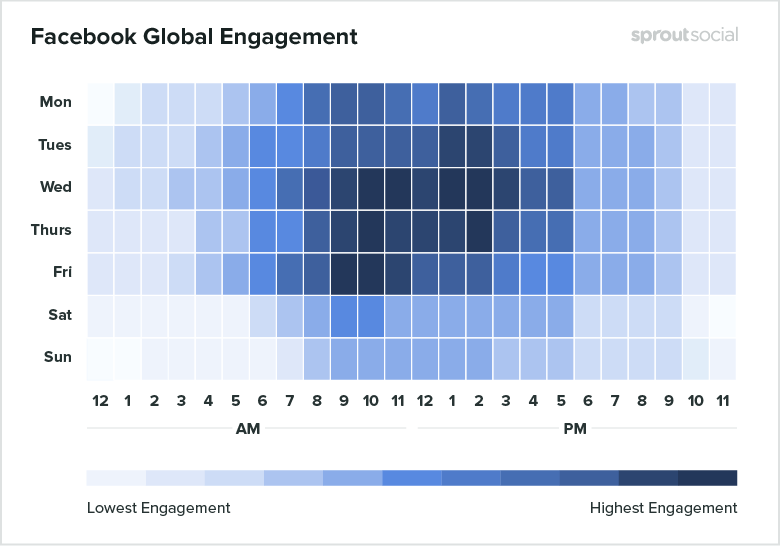 The safest times to post are weekdays from 9 a.m.–3 p.m.
Sunday has the least amount of engagement for Facebook during the week. Early mornings and evenings, before 7 a.m. and after 5 p.m. have the least amount of engagement per day. As you’ll see with other social networks, mid-week is the peak period on Facebook. 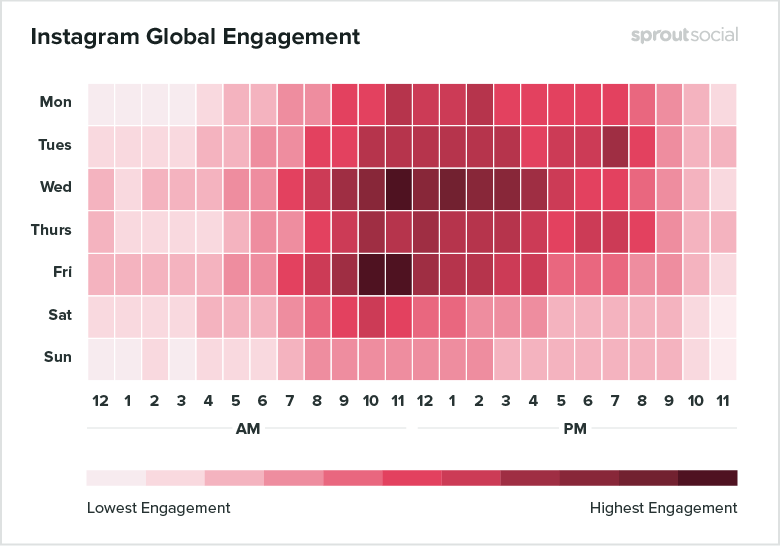 The middle of each weekday, from morning to mid-afternoon, are safe times to post, meaning engagement remains consistent throughout these blocks of time. While people frequently check in throughout the middle of the day to see what’s going on, the peak times are around lunch breaks. When people have more time to scroll through their Facebook feeds and dig into interesting posts, engagement rises correspondingly. On the other hand, late night and early evening along with weekend days bring in relatively low engagement. While people may check in or post a few updates from weekend activities in the middle of the day on Saturday, these times aren’t your best bet for reaching audiences. Disclaimer: Industry specific heat maps are more concentrated to show medium- and high-level engagement. 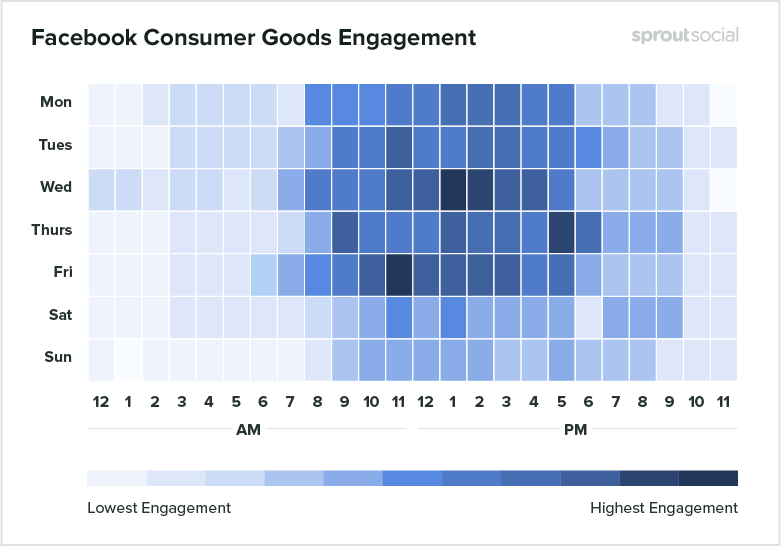 The best times for consumer goods brands to post to Facebook are Wednesday at 1 p.m. and Friday at 11 a.m.
Other high engagement times include Wednesday from 1–3 p.m, Friday from 10–11 a.m. and Thursday at 5 p.m. The safest times to post are weekdays from 10 a.m.–5 p.m. The lowest engagement is on Sunday and every day from 10 p.m.–4 a.m. The best times for media companies to post on Facebook are Tuesday at 5 p.m. and Friday from 8–9 a.m.
Other top times include Wednesday from 8–9 a.m., Wednesday at 5 p.m. and Thursday at 5 p.m. The lowest engagement is on Sunday and every day from 10 p.m.–3 a.m. The best times for schools to post on Facebook are Wednesday at 9 a.m. and Saturday at 5 p.m.
It’s safest to post Monday through Friday from 9 a.m–3 p.m, with the most engagement occurring between 9 a.m.–12 p.m. on those days. Saturday from 12 p.m.-9.pm is also highly active. 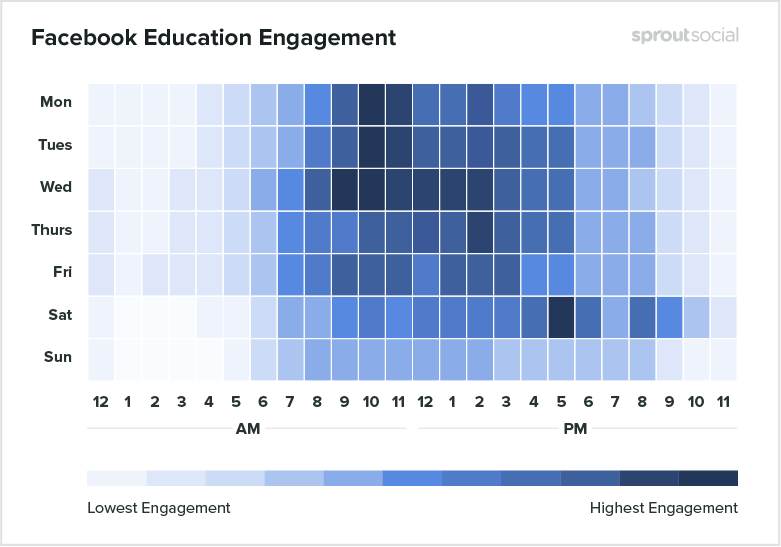 Sunday has the least engagement, and the lowest engagement times for schools are every day from 11 p.m.–5 a.m.
Facebook is a great place to highlight a nonprofit’s mission with longer form posts and discussions, as well as drawing attention to upcoming events. 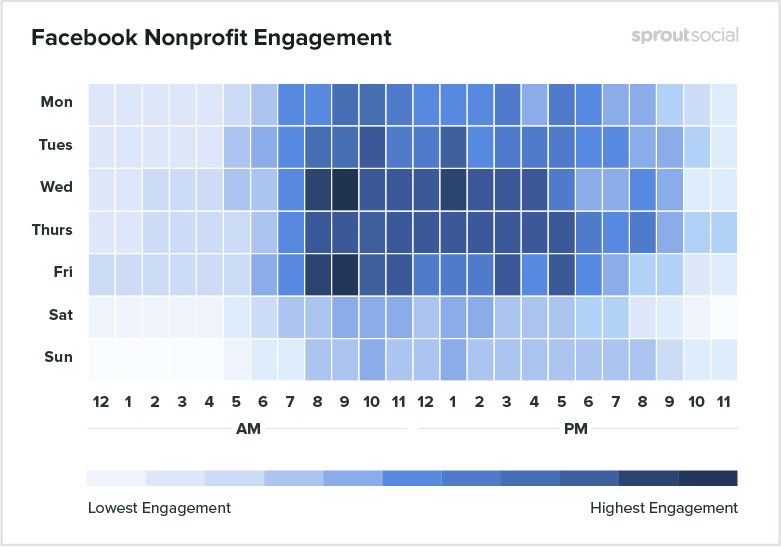 We found that nonprofits on Facebook frequently see the most engagement during weekday mornings. 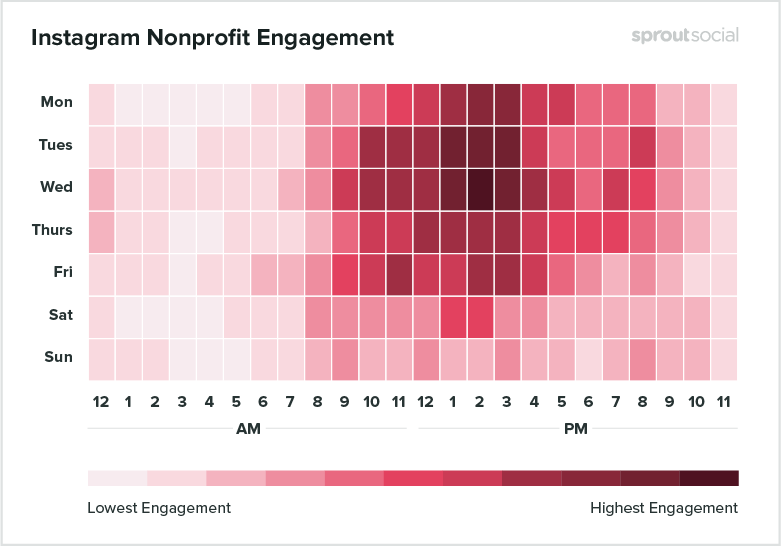 The best time for nonprofits to post on Facebook is Wednesday at 8–9 a.m.
Other high engagement times include Thursday at 10 a.m. and Friday 8-10 a.m. The safest times to post are Monday through Friday, 8 a.m. to 5 p.m.
Saturday and Sunday show the least engagement per day, and the lowest engagement times are 10 p.m.–5 a.m. every day. 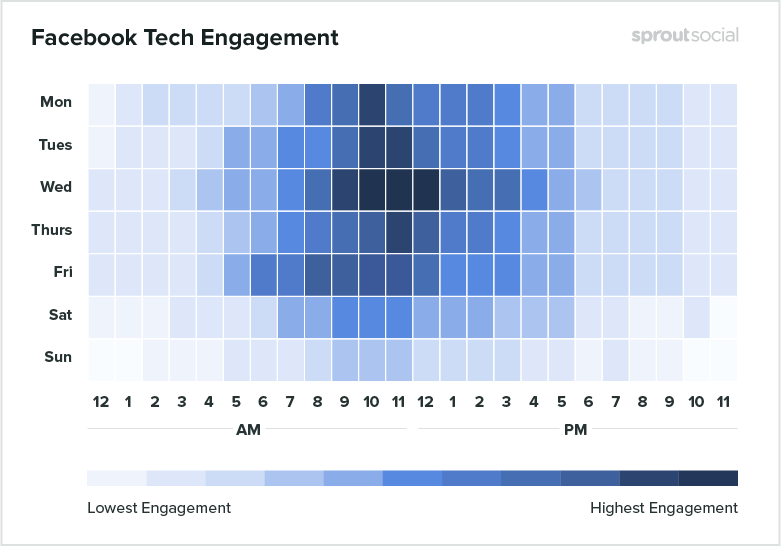 The best time for tech companies to post to Facebook is Wednesday at 10 a.m.
Wednesday from 9 a.m.-12 p.m. is a peak time during the week as well. The safest times to post are Monday through Friday 8 a.m.–2 p.m. 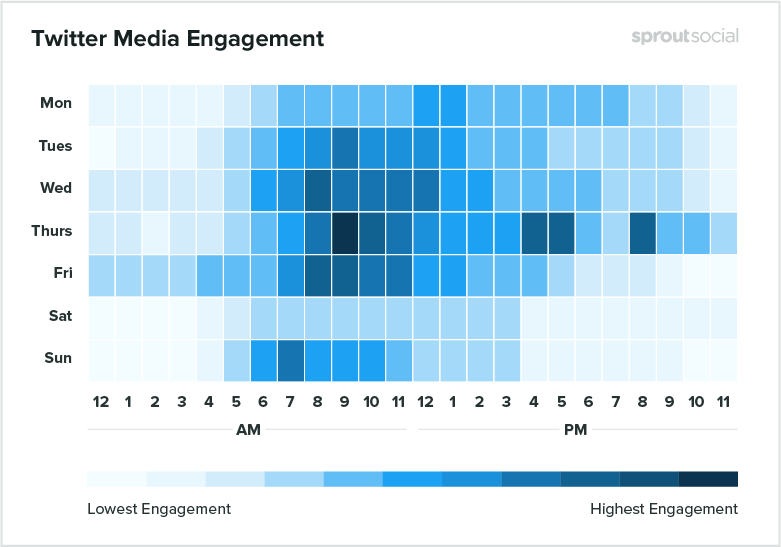 The least engagement is seen on Sunday and every day from 6 p.m–4 a.m. 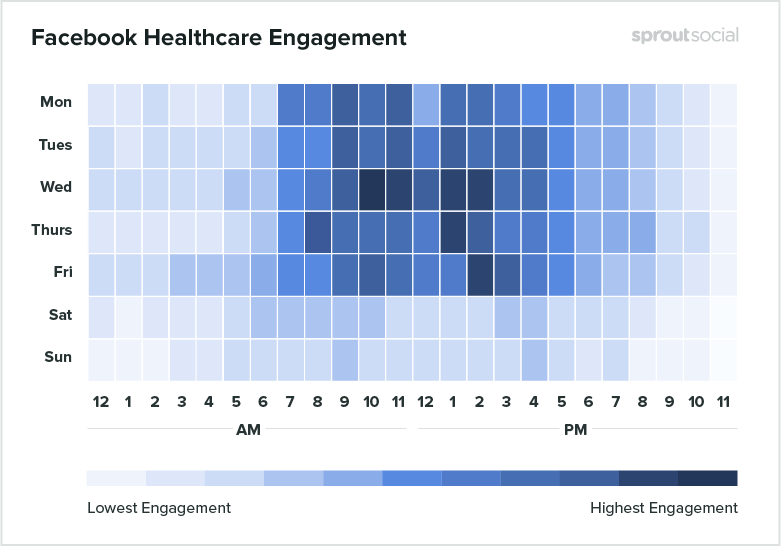 The best time for healthcare practices to post on Facebook is Wednesday at 9–10 a.m. The safest times to post are Monday through Friday, from 9 a.m.–3 or 4 p.m.
Times to avoid are Saturday and Sunday, which have minimal engagement, and every day from 9 p.m.–4 a.m.
Having recently grown to one billion monthly active users, and a median 1.60% engagement rate per post, Instagram is definitely on the rise in the social space. The network has also debuted a number of new features recently, expanding the options for how users can interact with posts on this visual-first platform. Similar to Facebook’s 2018 focus on a more authentic and personal-feeling social experience, the Instagram algorithm in 2019 prioritizes certain posts algorithmically in a user’s feed, marking a change from the previous reverse chronological order. In addition to the main feed, Stories has grown significantly since its 2016 launch, and 2018 also brought the debut of Instagram TV. Taken together, all of these options let brands create engaging video content of both micro-length and long-form templates. The best times to post on Instagram are Wednesday at 11 a.m. and Friday at 10–11 a.m. The safest times to post are Tuesday through Friday, 10 a.m–3 p.m. 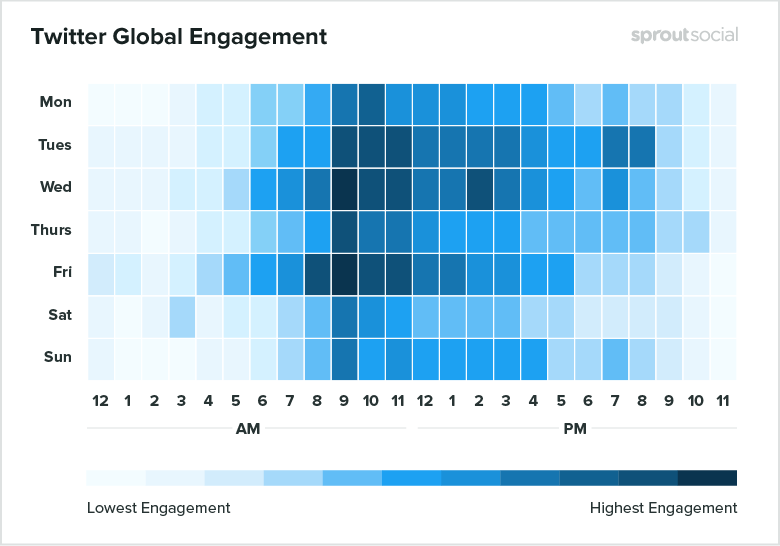 The least amount of engagement occurs during late night and early morning from 11 p.m.–3 a.m. 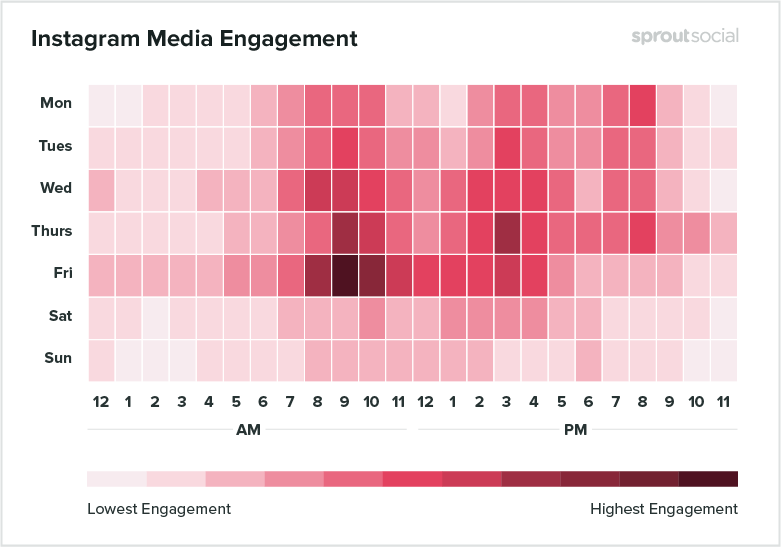 While Instagram engagement peaks mid-day and mid-week, similar to the other major social networks, there are a few opportune windows found in the evening and morning during the middle of the week. While the safest times to post are still during those core weekday times, it could be well worth it for certain brand niches to consider if your audiences are among those reaching for the ‘Gram first thing in the morning or last thing before sleeping. The best time for consumer brands on Instagram is Wednesday at 3 p.m. The safest times to post are Monday through Friday, 11 a.m.–5 p.m.
Another higher engagement time period occurs on Saturday around 10 a.m.
Sunday has the least engagement, as well as every day from 11 p.m–3 a.m. The best time for media companies to post on Instagram is Friday at 9 a.m. The safest times to post are Wednesday through Friday from 8 a.m–4 p.m.
There’s also a period of higher engagement that lasts all the way through Thursday night into Friday morning. It’s lower than the highest peak times, but it could be a unique time to capture audiences that aren’t active in other industries’ niches. Saturday and Sunday have the least engagement for media companies on Instagram. The best time to post on Instagram for schools is Friday at 10 a.m.
Other high engagement times include Wednesday at 11 a.m., Friday from 11 a.m.–12 p.m. and 2 p.m., and Saturday at 6 p.m. and 8 p.m. The safest times to post are Wednesday through Saturday at 10 a.m.–8 p.m. 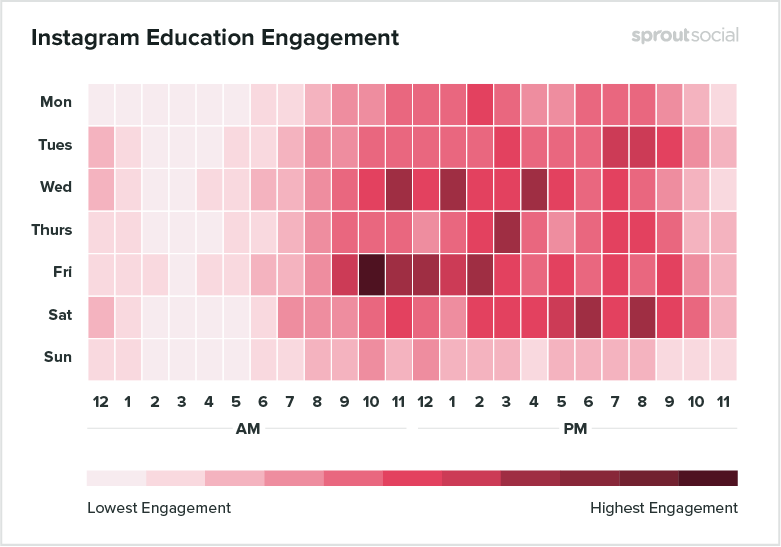 The least engagement for schools is on Sunday and every day from 11 p.m–5 a.m. The best time for nonprofits to post to Instagram is Wednesday at 2 p.m.
Other high engagement times include Monday from 2–3 p.m., Tuesday from 1–3 p.m. and a relatively strong block of time on Saturday from 1–2 p.m. The safest times to post are Monday through Friday, 10 a.m.–4 p.m.
Sunday gets the least engagement, as well as every day from 11 p.m.–5 a.m. 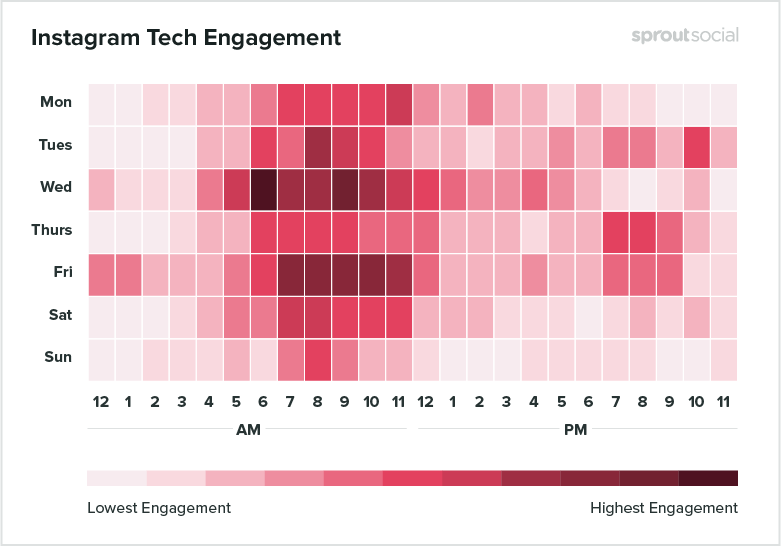 The best time for tech companies to post on Instagram is Wednesday at 6 a.m. and 9 a.m.
Other times that get significant engagement include Wednesday from 10–11 a.m., Friday from 7–10 a.m., and Saturday from 7–11 a.m.
There’s also fairly high opportunity for engagement on Tuesday at 10 p.m., and both Wednesday and Friday mornings show more engagement than other industries at these early hours. The least engagement on Instagram for tech happened on Sunday. The best time for healthcare practices to post on Instagram is Tuesday at 8 a.m. The safest time to post is Tuesday from 7 a.m.–4 p.m. 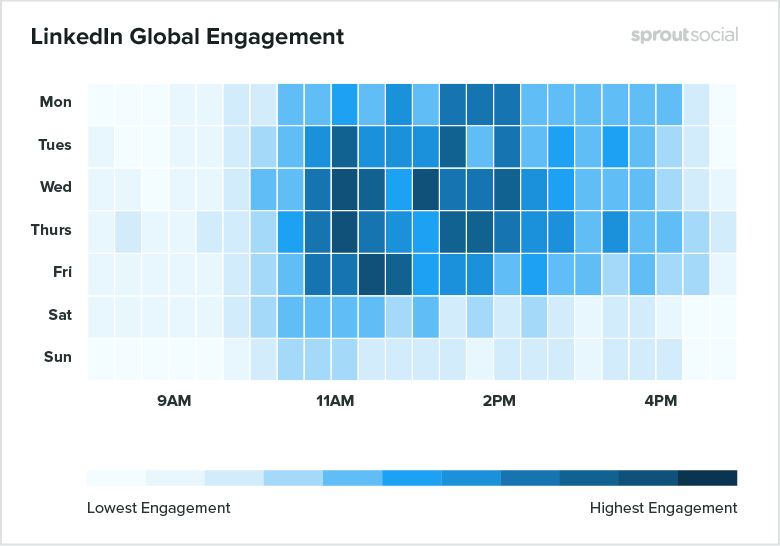 The lowest engagement times are evening and overnight every day from 6 p.m.–6 a.m.
Twitter presents a huge opportunity for brands to connect directly with audiences and manage customer care. This means timeliness is key on Twitter. While the social network selectively highlights some activity out of chronological sequence based on user interests, most people are still scrolling through to catch up on the latest posts and musings from their group of followed accounts. Posting at off-peak hours could and cause you to miss out on a lot of your potential engagement. The best times to post on Twitter are Wednesday at 9 a.m. and Friday at 9 a.m.
Tuesday and Wednesday are the best days to post on Twitter. The safest times to post are Monday through Friday from 8 a.m.–4 p.m.
Saturday gets the least engagement. Times to avoid that get the lowest engagement are every day from 10 p.m–4 a.m.
Twitter heats up a bit earlier in the morning, probably as audiences are starting to go about their day and take a moment to catch up on and digest the biggest news and updates from their areas of interest. The peak times of engagement also carry into the lunch hour, and begin to taper slightly through the late afternoon and evening, finally dropping off as late night approaches. Like other social networks, mid-week on Tuesday and Wednesday are your top days to post on Twitter, and engagement drops off on weekends. We do still see that morning check-in occurring around 9 on both Saturday and Sunday, just to a lesser extent. 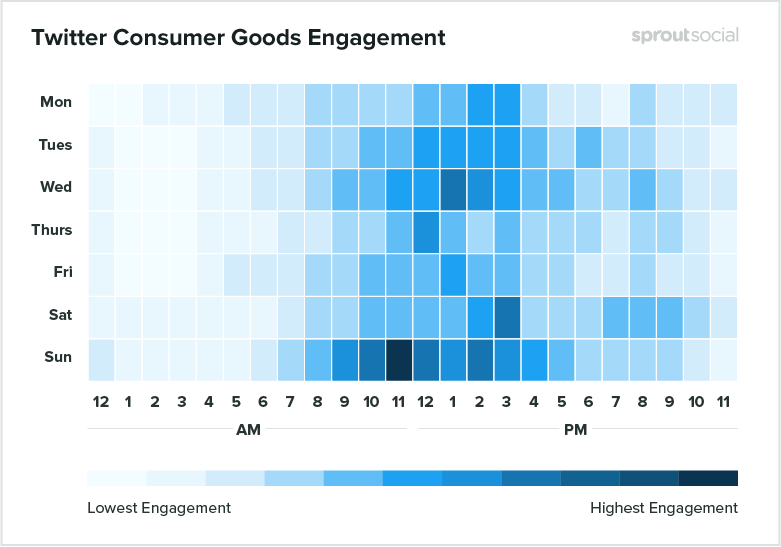 The best time for consumer goods brands to post to Twitter is Sunday at 11 a.m.
Other peak engagement times include Saturday at 3 p.m. and Wednesday at 1 p.m. The safest times to post are either Sunday from 9 a.m.–3 p.m. or Monday through Wednesday from 12 p.m–3 p.m.
Friday is the day with the lowest engagement, and the lowest engagement times each day are between 10 p.m–6 a.m. The best times for media companies to post on Twitter are Thursday at 9 a.m. and 8 p.m.
Other high engagement times include Thursday from 4 p.m–8 p.m. and Friday from 7 a.m.–11 a.m. The safest times to post are Tuesday through Friday from 8 a.m.–12 p.m. The day with the least engagement on Twitter is Saturday. 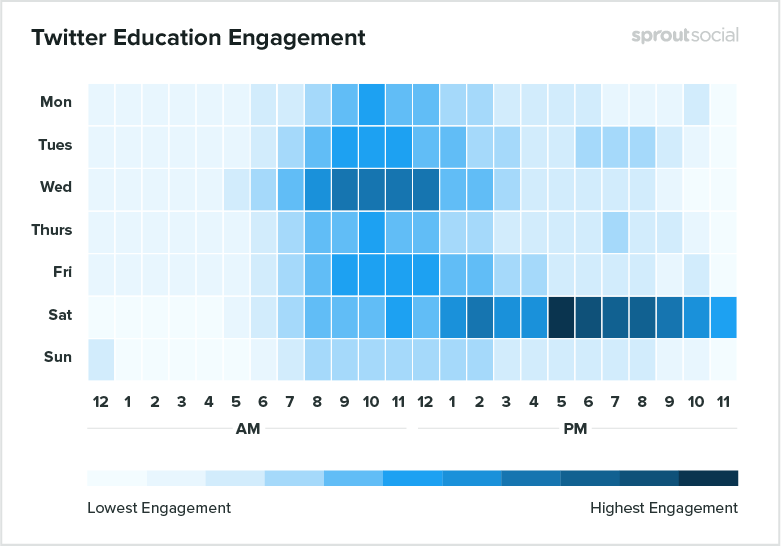 The best time for schools to post on Twitter is Saturday at 5 p.m.
Other high engagement times include Saturday from 1 p.m.–10 p.m. Weekdays get a bit less engagement, but safe times to post during the week include Wednesday from 8 a.m.–12 p.m. and Friday from 9 a.m.–12 p.m. 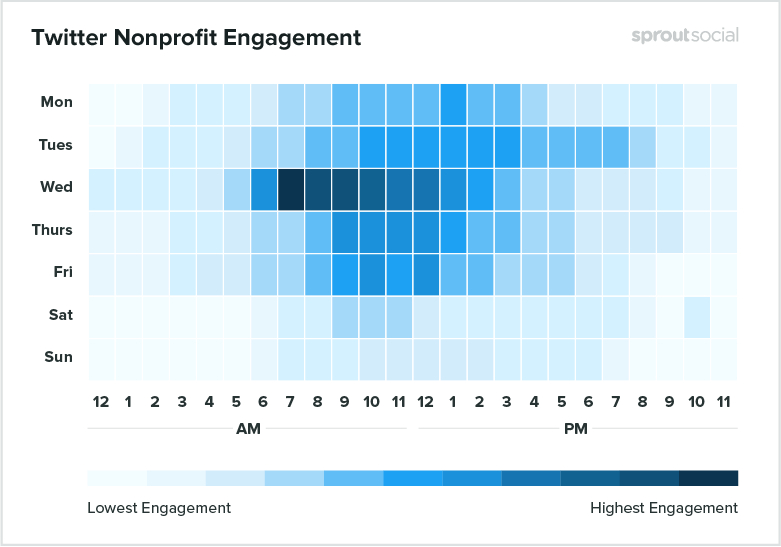 The best time for nonprofits to post on Twitter is Wednesday at 7 a.m.
Other high engagement times include Wednesday from 6 a.m.–4 p.m. The safest times to post are Tuesday through Friday from 8 a.m.–3 p.m.
Saturday and Sunday get the least engagement, as well as every day between 10 p.m. and 4 a.m. 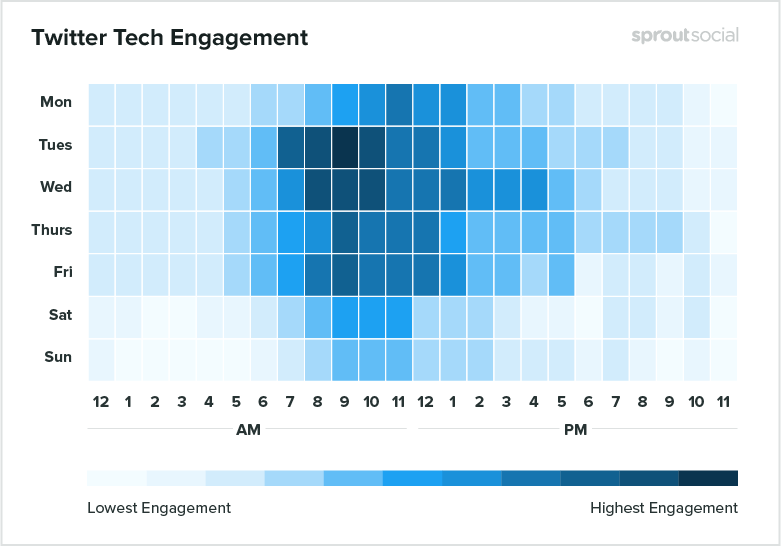 The best time for tech companies to post on Twitter is Tuesday at 9 a.m.
Other high engagement times include the rest of the morning on Tuesday from 7–10 a.m. and Wednesday from 8-10 a.m. The safest times to post are Tuesday through Friday from 8 a.m.–1 p.m.
Saturday and Sunday are the days that get the least engagement, and engagement is lowest from 6 p.m to 5 a.m. every day. 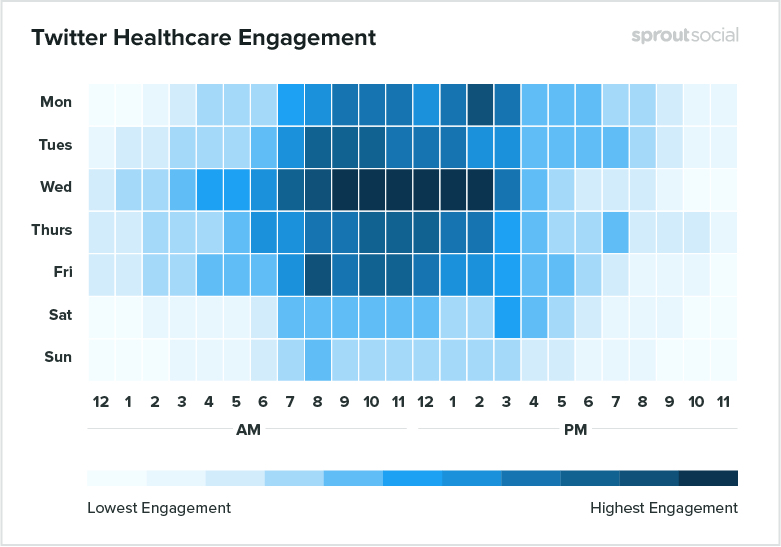 The best times for healthcare practices and business to post on Twitter are Wednesday at 9 a.m. and 11 a.m.
Other notably high engagement times include Monday at 2 p.m., Wednesday from 10 a.m. to 2 p.m. and Friday at 8 a.m. There’s also additional engagement on Wednesday morning compared to other weekday mornings. The safest times to post are Monday through Friday from 8 a.m.–3 p.m. The day with the least engagement is Sunday. LinkedIn targets a more specific audience than other social networks, and as it continues to grow, we’ve gotten a fuller picture of the best times to post compared to our overview in 2018. In order to provide the greatest accuracy, we didn’t break down this data into individual industries. The best times to post to Linkedin are Wednesday at 9–10 a.m. and 12 p.m. The safest times to post are Tuesday through Friday from 8 a.m.–2 p.m. The least engagement per day occurs on Sunday and the least popular times to post are every day from 9 p.m. to 3 a.m. Considering LinkedIn’s corporate-minded mix of thought leaders, job seekers and company page curation, it’s no surprise that activity is much more concentrated around workdays. Activity ramps up on Tuesday as people get through the Monday rush, and tapers fairly uniformly after 3 p.m. as the last tasks of the workday take priority. Weekends garner fairly low engagement, which is expected as people step away from their devices and desks on Saturday and Sunday. We understand that these type of reports can raise questions about just where the data is coming from. That’s why we want to be clear about the data we pulled and how we got here. 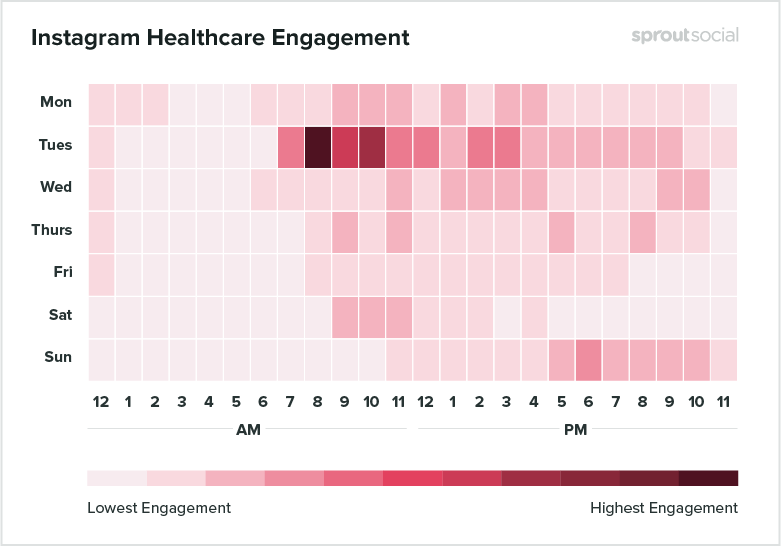 First off, we were luckily enough to work with Sprout Social’s very own data science team to gather together this information from our customers. Joel Booth, a Senior Data Scientist at Sprout, explained how it all works. Our data team is constantly collecting data. And this information isn’t just used to put together amazing reports like you’ve read above. In fact, Sprout Social’s very own ViralPost works off this data regularly for our customers. Booth further explained that Sprout’s proprietary algorithm analyzes the publishing history of our customers and collects data on how and when their audiences engage. This is what makes ViralPost so unique—it allows users to find future times to post that work best for their channels. Simply put, having publishing times is extremely handy, but why not use a tool that can publish during the suggested times? ViralPost works with actual customer data, just like what we’ve pulled to assemble this report, to give you the best opportunity for your individual account. Want to see it in action? 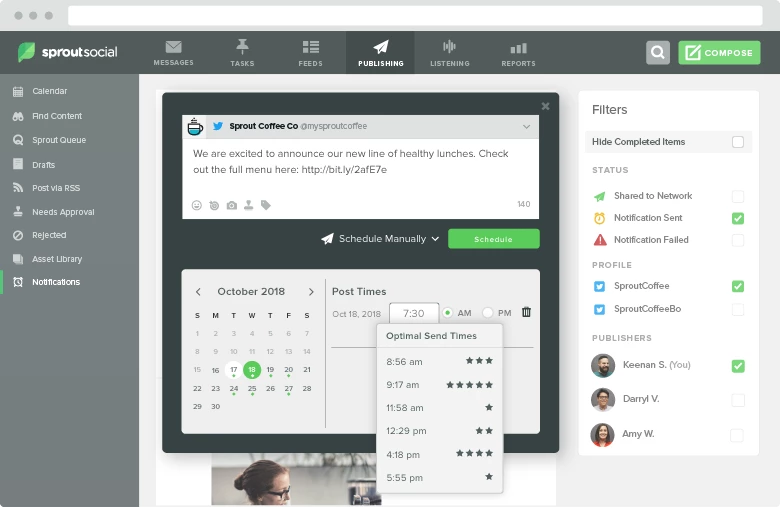 Sign up for a demo of Sprout Social today!